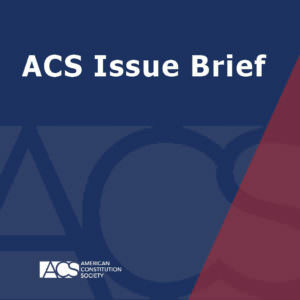 ACS is pleased to distribute “Is Our Dysfunctional Process for Filling Judicial Vacancies an Insoluble Problem?,” an Issue Brief by Russell Wheeler, Visiting Fellow in Governance Studies at the Brookings Institution and President of the Governance Institute. Among the solutions Wheeler suggests to improve the federal judicial selection process are near-term fixes such as the White House’s publicizing the status of its negotiations with senators over possible nominees, and longer-term remedies, such as the creation of a bipartisan task force to propose changes that would be debated in the 2016 elections and adopted by the next administration and incoming 2017 Senate. Read the full Issue Brief here: Is Our Dysfunctional Process for Filling Judicial Vacancies an Insoluble Problem?